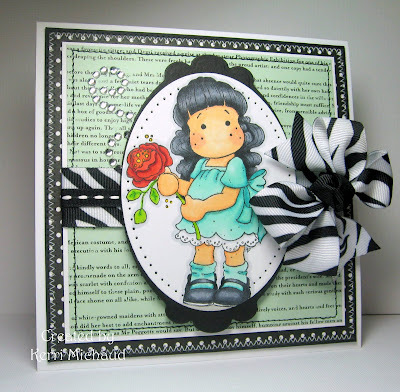 Really Reasonable Ribbon Challenge~Black and White! Hello! I hope you are all having a wonderful Saturday so far:) It's been pretty rainy and gloomy here, so I thought that was a good excuse for me to sit down a make a card! The current challenge at Really Reasonable Ribbon is Black and White! I had some fabulous black and white ribbon from last month's Ribbon Club Assortment, including this super fun zebra print, and this black with white stitches ribbon. A really cute card and what a neat idea with the bow! Very creative! Such an adorable card! Are you gonna watch the Pad? I think I'm gonna watch the first episode and decide, lol. This is gorgeous Kerri!! I so love your coloring of sweet Tilda, the black and white ribbon, and your dp. Gorgeous girl!! These girls kinda scare me...they don't have mouths....isn't that weird? You're a good colorer, can't you color one on? 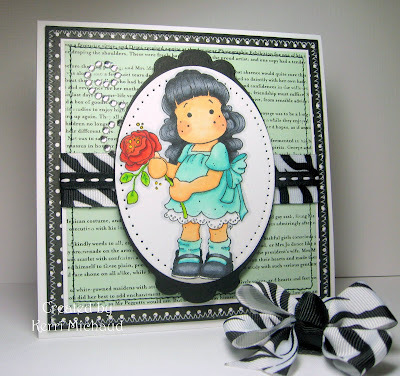 LOL I love the black and teal though - and the little bow as part of the card is pretty cool. Absolutely adorable! I'm laughing at myself too b/c I was thinking, "oh, how cute would that be if she made that a hair bow and just clipped it to the card??" lol Love this idea!!! This is gorgeous! Love the image and bow! Thank you for joining Really Reasonable Ribbon's Black and White Challenge. PS. Have have some blog candy over on my blog, if you'd like to check it out!